Comments: The first of two shows in Vienna, on 'The Works' tour (29th & 30th September). Show has previously been released on 2CD (silver pressed) by Japanese 'Gypsy Eye' label, with title 'Great Queen In Vienna' 2CD. I'm not sure which tape source has been used on this release. The Elton John cover song 'Saturday Night's Alright...', which Queen has played several times over the years, is more than less a improvisation version. The only lyric Freddie sings is just the song title, repeated several times. Track 5 to 9 on CD ONE, is played more than less as a medley, the same with track from 16 to 20. Roots: From audience recorded tape. Some copies has this separate DVDR as a bonus. This time, not only the Magic Tour in 1986, will appear a new title that was recorded the best sound source from 1984 Works tour. At that time, sales to large failed (but now such While momentum of the re-evaluation is increased) “HOT SPACE” album, which was summarized in orbit corrective sound after, it is “THE WORKS”. Route change of this sound is now to appear larger in the live sound of the Queen. “Another One Bites The Dust,” a big hit also groove-oriented stage sound, which has been promoted as a trigger to be reviewed, and the Shinsenaizudo been tight sound unique to the mid-1980s to the Queen seems to rock sound has been taken into account is. While it was a great success in terms of record sales, it is a famous story that has become a result of making a groove between the groups. Still large that Mise to redeem the stigma of the “HOT SPACE” in sales surface, even while lower the motivation to continue the group between each person, is the Works tour was to begin the tour somehow. Speaking of this tour image, it is carried out of the negative situation as was thought until the dissolution of the Queen, until you eventually resurrected in Live Aid I have rooted the image that time you did not with the package,. And in ’85 Yoyogi of live video that was multiplied by the wheel has been generated from this tour. It does not have so to say only that it was worse the minute is that it was a few months ago of Live Aid. But if you listen to “THE LAST LIVE IN JAPAN” of our release, such even a time, for example, on May 9, which should it can be seen that had been showing off the performance with a lively surprisingly at Budokan. It is also of our release title that performance with a further lively in 1984 is a tour the first half has been showing off has proved. It “ESPECIALLY MILAN”, “DYNASTY” which has become a Sold Out and the other day is the best example, both the sound quality is superb. In addition, not only 84-year Works Tour’s first complete recording of the sound board recording, shocking excavation from the tour that had caused a major uproar But “COMPLETE SUN CITY”, have also of substantial performance is showcased thing is to thing that surprised the mania around the world, that was recorded Sold Out as early as surprise had to prove it as what Works tour sound source than. Rather, a storm of accusations against the winding happened Queen after the Sun City performance what, seems to have become a turning point in the bad sense for Works tour. And passed also the time of more than 30 years from the Works tour, now that give an imitation of release at the limit of the press CD, you do not have should be recorded, such as audience recording of easy matter. This time, recorded in Vienna performances September 29 from the first-generation copy of the master. 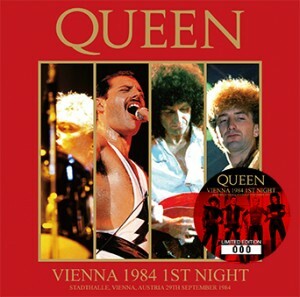 Says the real and of ’84 Vienna, the first day of the title “GREAT QUEEN IN VIENNA” from GYPSY EYE label of nostalgia there was a past that was released. It is also yet state that this time (this time you Yes to replace the voice of the title voice) voice of the audience shot the video that comes with the release first delivery worth of that based on, surprisingly played captured by the big sound and from it was, it was what had gotten a good evaluation in its own way even among enthusiasts. “I have another sound source to surpass it lightly, why? Do not use it.” On the other hand from overseas mania is what has been said. In this release, and we realized finally limited press CD release of the audience recording, which boasts the best sound quality in this another sound source. Although sound quality to be worried about, the same Works rather than realism and clearness importance of recording the state of “DYNASTY” is also the name board of the tour, recording a state close to on a sound image of the strong force is an attractive “ESPECIALLY MILAN” speaking of, I think just how high-quality sound is get to imagine. If that happens, definitely ideal audience recording to enjoy from beginners to enthusiasts. Because this is about superb sound quality of, also captured in realistic appearance tone is one more of Freddie’s voice on this day. Originally Works tour is also a time to hit the corner of Freddie throat, his voice occasionally “Ikatsuku” is what state is found. If it is also the 1984 European tour late, the state of this day will thing that there is no be helped. It appeared to really pained scene in the early stages of “Somebody To Love” and “It’s Hard Life”. However, the place of the great Freddie of the day, but still loosen any force, because he has Mise banged sing without removing the hand surprise. And precisely because it is superb sound quality that enthusiastically the first time, would be even more so because of that enjoy realistic. So, this is what’s the source of the testimony that captures the vibrancy that has been overlooked in the Works tour. Performance of other members to listen to upset the first time of such Freddie to cover Senbakari is also great. Such mood interesting in the lose its guitar string at the “Hammer To Fall” was approaching the chorus (if repelled people the guitar, there should strange sound is notice how the sound), spare until passed, is suddenly happening to the sound of the guitar disappears to. And the latest of a big hit, “Radio Ga Ga” from the configuration of “I Want To Break Free” is played in a live late, serving active duty band presence comes through To acutely. ’84 Vienna first day appeared after a long time in the sound source, which boasts such a best content and sound quality. 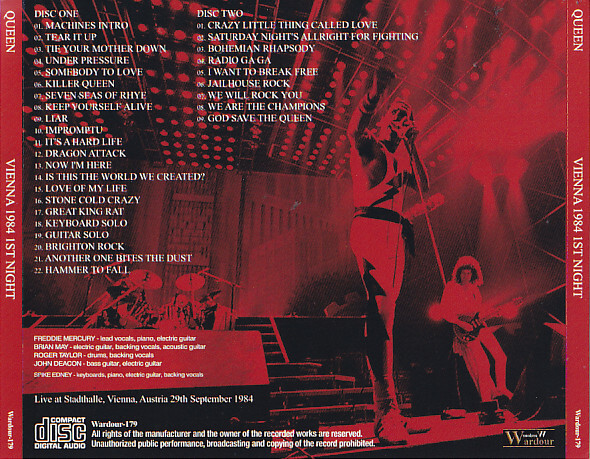 And it was the annual on this tour as “Saturday Night’s Alright For Fighting” part and the “I Want To Break Free”, such as the beginning of “We Are The Champions”, described above with respect to short defects have occurred in several places achieve a complete recording and adjust sound source. A new name board will appear here from ’84 Works tour, second only to “COMPLETE SUN CITY” in the last year!